Get Hired is a free job search app that lets you search for jobs, location wise and according to their freshness or type. It shows the results of job searches from 8 different job portals, including Indeed, Juju, Linkup, Careerjet, Simply Hired, Career Builder, Usajobs, and Jobserve, all in one consolidated platform. It lets you read the job summary, save relevant jobs in favorites, and email the select job to particular email address. Besides this, it also shows the recent job searches and last viewed jobs. This app is developed targeting job seekers in various sectors. If you are in need of a job and don’t want to waste your time searching for jobs on different job portals, then this free job search app is a perfect solution to all your trouble. The free job search app is available under the Business Category in Windows Store. You can download the free app by clicking here. There, click on the “View in Windows Store” Button, this opens the app’s page in Windows Store. Finally click on Install. You can also search the app in Windows Store and install it from there. When you run the app, you’ll get a window that looks like the following screenshot. This is the Home Screen of the app. The job search options are under the Find Tag. Simply fill in the necessary fields required for the job search (Job Title, Location, Country, Job type, and Job age) and finally click on the Jobs button. That’s all you have to do, it’s that easy and you’ll get the list of jobs from each job portal in the next screen. Simply click on the desired job to see it’s details, or if you wish to see jobs from just one portal then click on the portal name. 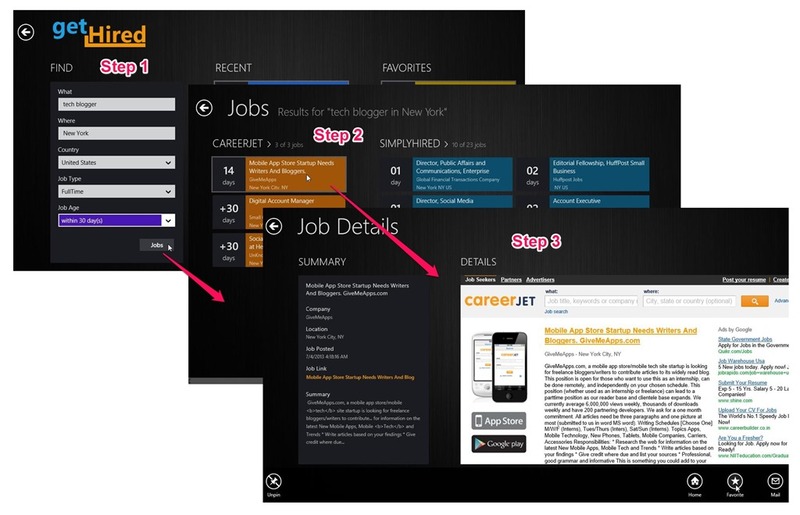 Following is a screen shot that shows steps for searching a job. You can also filter a particular job search according to relevance, search distance, freshness etc. Just go to the search result screen and right click, you’ll get the buttons to filter, pin-unpin, and jump to home screen. Choose the desired one. Get Hired is a smart job search app; besides viewing jobs and their details, you can email the relevant job along with its details to a particular email address. Or you can also save it under favorites (home screen), so that you can quickly retrieve the relevant jobs for later use. The Recent Tag on the main screen shows the recently viewed job searches along with the number of results and Last Viewed Tag shows last viewed jobs. So if you wish to see the search results again then just click on the requisite job search. 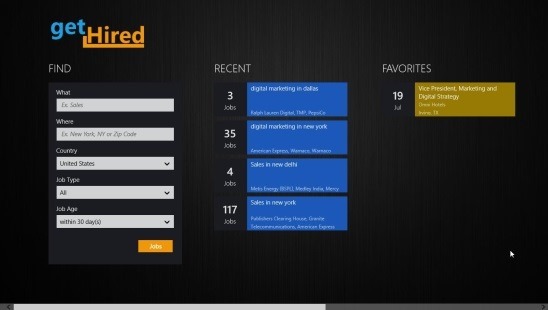 You can also pin any page of Get Hired to your start screen for one click access. Simply go to the desired page and make right click, you’ll get the option to pin at the bottom left corner. Free Job search app for Windows8. Shows search results from 8 different top job portals in one platform (the best thing in the app). Allows filtering based on type, freshness, and location for job searches. Allows to save relevant jobs in favorites. Allows to pin any screen to start menu for quick access. Different colors for different portals, which makes it easy to recognize jobs from different portals. Navigating between screens is easy. Also check out MyStarJob and TimeCrunch. Get Hired is a really handy and powerful job search app. It helps you find the desired jobs in few simple steps. It’s easy to operate and gives results in fraction of seconds. The features such as favorites, recent searchers, and pinning etc., makes it a smart app. The app has got lots of pros; the best thing about the app is, it shows results from 8 different job portals on one screen. Try this free app and find jobs instantly!